The Center for Well-Being at Washington University in St. Louis had not updated their web presence since the early 2000s. They desired a more professional and modern website and also needed to be able to update the website themselves. They also took the opportunity to reorganize the site to make it more user-friendly and consistent. Being a non-profit organization with a limited budget, the natural solution was to use Joomla!, a free, open-source content management system. 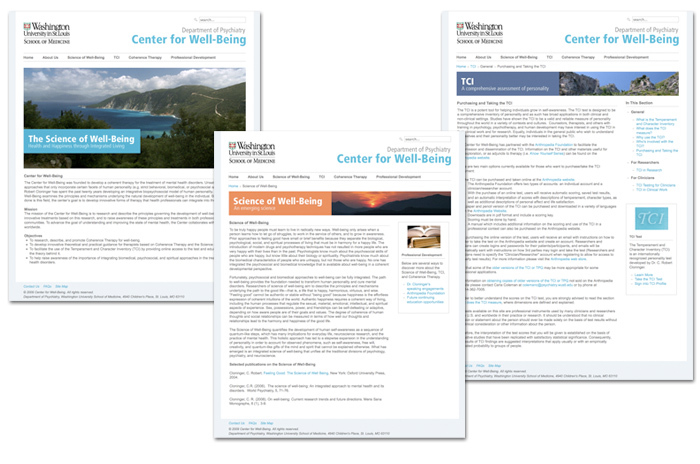 The Center for Well-Being is thrilled with their new site. In fact, upon reviewing the new site designs, the director of the center remarked that he wished they'd redesigned the site years ago.